A Burlesque Tribute To Everything Quentin Tarantino is coming to Dallas!! Higgy Productions is bringing a Quentin Tarantino tribute to the stage in the form of an AWESOME burlesque show that will have the beautiful ladies of Texas perform their routines in the style of Tarantino films. 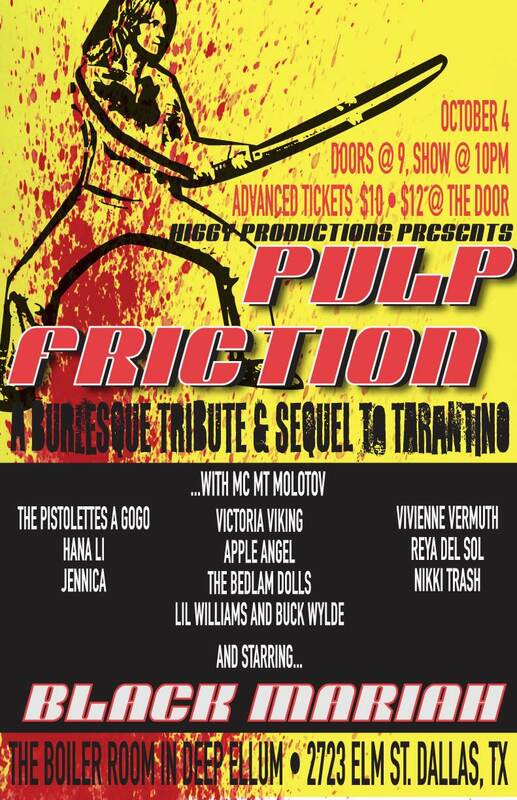 This badass show is called ‘Pulp Friction‘ and I’m sure you will see people dressed up as every character Tarantino thought up along with some excellent music. Black Mariah, Vivenne Vermuth, Reya Del Sol, Apple Angel, The Bedlam Dolls, Lil Williams and Buck Wylde, Victoria Viking, Hana Li, Jennica, The Pistolettes a GoGo, and Nikki Trash will all be performing live at the Boiler Room in Deep Ellum on October 4th. Show starts at 10pm so get your tickets now an d enjoy a great show. Quentin Tarantino Takes A Stab At The True Crime of Charles Manson For Next Project!!! Roadtripping Austin, TX Movie Style!!! This entry was posted on Tuesday, September 30th, 2014 at 10:57 am	and is filed under Events, Film, News. You can follow any responses to this entry through the RSS 2.0 feed. You can skip to the end and leave a response. Pinging is currently not allowed. « The Zombie Video Game, ‘Dead Rising’ Is Getting the Feature Film Treatment! !